VoIP Phone Systems & Services | Biztek Solutions, Inc. Your traditional PBX phone system has served you well. In all likelihood, it’s already paid for. So you have a certain incentive to stick with it. That may seem like a safe choice on the surface. After all, changing your communications systems is a significant undertaking and entails a certain amount of risk. However, it may be far riskier to stay with an out-of-date and underperforming on-premises PBX. Eliminate disjointed, inefficient multi-vendor communications. Biztek Solutions is a registered partner with 8×8. 8×8, Inc. is the trusted provider of secure and reliable enterprise cloud communications solutions to more than 40,000 businesses operating in over 100 countries across six continents. 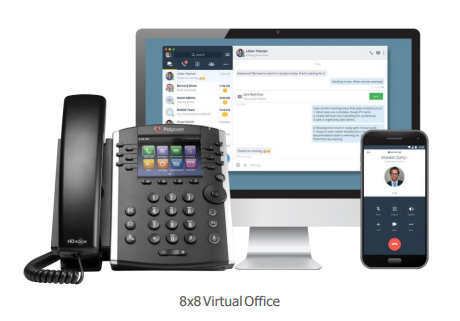 8×8’s out-of-the-box cloud solutions replace traditional on-premises PBX hardware and software-based systems with a flexible and scalable Software as a Service (SaaS) alternative, encompassing cloud business phone service, contact center solutions, and conferencing.